Brussels sprouts, the cute miniature cabbages are believed to be originated from ancient Rome. They belong to the cruciferous family of vegetables like Cabbage, Broccoli, Collard greens etc. They are good source of vitamin A, vitamin C, folic acid and dietary fiber. Moreover, they are believed to protect against certain types of cancer. There is a slight bitter taste for Brussels sprouts, which may vary from person to person. Research suggests that the bitter taste variation may be due to genetic differences among people. Brussels sprouts picked after the frost are supposed to have the higher concentration of sugar content and less bitter. 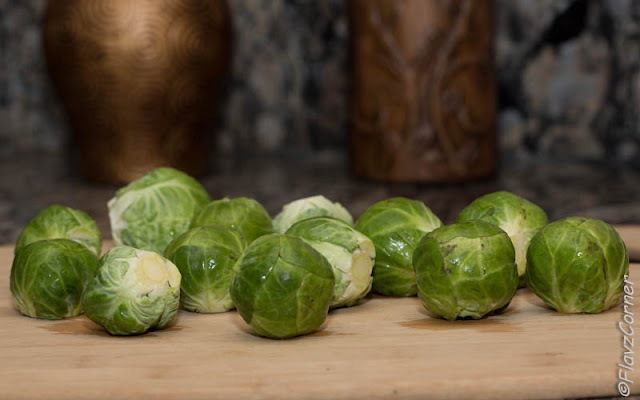 The best known method of preparing Brussels sprouts is by steaming, microwaving, and stir frying which does not result in significant loss of the sulforaphane, the anticancer chemical. Recently one of my friends from our church, who also seeks the ideas of healthy diet, was nice enough to share this healthy recipe with me. I had tweaked the recipe a little bit. I got a chance to pick up some fresh Brussels sprouts from the local Farmers Market near to my house yesterday and wanted to give this recipe a try. There are lots of variations to this recipe. Go ahead and be creative and adjust the ingredients to fit your palate!!! If you are looking for a quick low fat and healthy diet, this recipe is for you!!! Wash the Brussels sprout and remove the yellow leaves if any. Cut the stem off and quarter the sprouts. 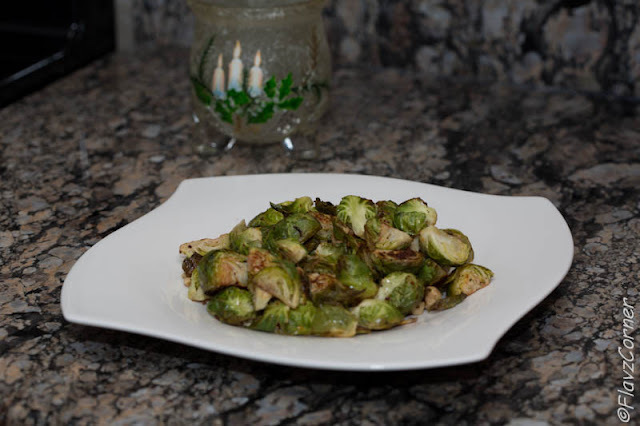 Place the cut Brussels sprouts in a bowl and toss the rest of the ingredients. Arrange the quartered Brussels sprouts on a baking sheet and bake for 12 minutes. Take it out and flip the sides and bake for 3 more minutes. Serve as an appetizer or as a side dish. You can bake it more if you prefer a crispy texture. The more you bake, the chance to lose the nutrients will be high. that was awesome!...frst time here...happy to follow u...glad tat u do the same! Good one . Am your new follower. Glad if u will follow me back.